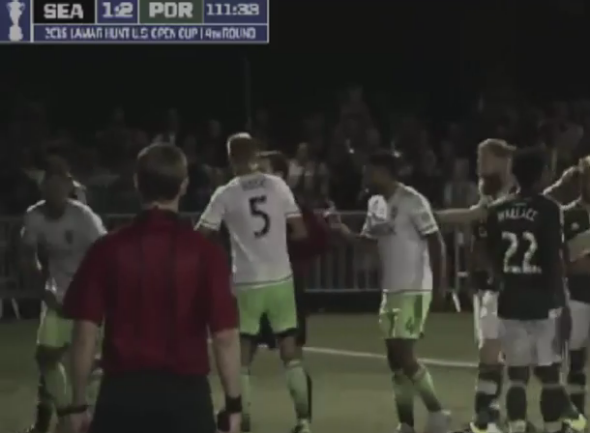 Clint Dempsey notebook video: American star red-carded, could be suspended. Dempsey, far left, in the act of tearing up the referee’s notebook. Clint Dempsey is the United States’ best-known soccer player, and possibly its best player period—and the U.S. men’s national team might have to play this summer’s high-profile Gold Cup without him after he lost his temper and shredded a referee’s notebook during a contentious club match on Tuesday. Two other Sounders players were red-carded in the team’s 3-1 loss, and another was injured after all Seattle’s allotted substitutions had been taken, so they finished the match with only seven men on the field. That’s pretty straightforward—it would be hard to argue that something taken out of a referee’s hand isn’t his “property”—and given that the USSF runs the U.S. men’s national team, it would seem that Dempsey should miss the Gold Cup, which begins July 7. The organization has not yet made any official statement on Dempsey’s status, but a determination is expected soon.